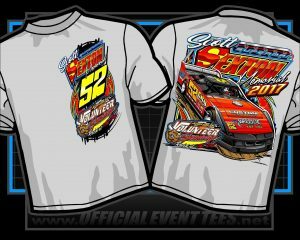 BULLS GAP, Tenn. — Official Event Tees has created a special design Scott Sexton Memorial T-shirt that will be available for sale Friday, April 28 at Volunteer Speedway. This T-shirt pays tribute to an East Tennessee racing legend, Scott Sexton of Pigeon Forge, who sadly passed away at the young age of 46 on January 10, 2013, after battling health issues for seven years. Be sure to pick up a Scott Sexton Memorial T-shirt while you’re at “The Gap” on Friday, April 28. Also, check out the all-new for 2017 Volunteer Speedway T-shirt design, hoodie and hats that are for sale at each event at the track.